The Conrad Fort Lauderdale Beach, hailed as the new beacon of luxury on Fort Lauderdale’s exclusive North Beach, redefines ultra-elegant hospitality. The newly open resort overlooks the beach and waters of the Atlantic Ocean as well as Intracoastal Waterway, offering unmatched 290 all-suite accommodations. The resort also offers indoor and outdoor dining venues, a 4,000-sq ft spa and fitness center, an elevated ocean-facing Sky Deck oasis with heated pool and cabanas, as well as 10,000 sq. ft. of flexible meeting and event space. Designed with a contemporary flair and inspired by Downtown Hollywood’s burgeoning arts scene, CIRC Hotel, a 111-room modern, boutique hotel designed with a contemporary flair and inspired by Downtown Hollywood’s burgeoning arts scene, opened on Young Circle in May 2018. The 12-story building features Olivia Restaurant & Bar by Piero Filpi, The Muse Rooftop Bar & Lounge, and 3,000 sq. ft. of meeting space on the 11th floor. CIRC Hotel is located in the heart of vibrant Downtown Hollywood, within walking distance of numerous restaurants, bars, cafés and boutiques. Hotel Morrison, a 143-room select service boutique hotel in Dania Beach, offers upscale accommodations with environmentally-friendly products and 1,500 sq. ft. of meeting space, including a pre-function area that flows into the pool deck. Amenities include 24-hour shuttle to and from the airport, cruise port, beaches, casino, shopping and restaurants, along with a full American breakfast buffet. The new nautical-themed TRYP by Wyndham Maritime Hotel opened its doors in May 2018. The eight-story, 150-room, maritime boutique hotel caters to business and leisure travelers as well as boaters. The hotel sports a European/Mediterranean nautical style décor and features a Spanish Tapas Bar. 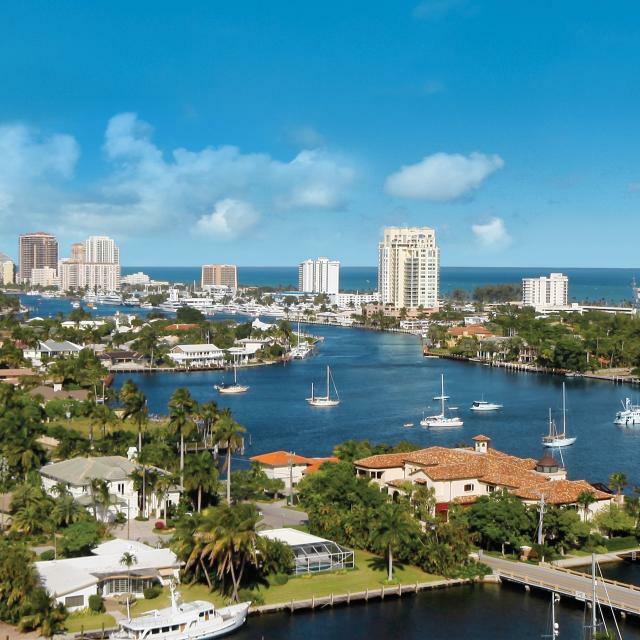 Located on Marina Mile, the hotel has access to the 168-slip Marina Bay Resort, one of the few marinas in the Southeast coast of Florida that can accommodate mega yachts and offer charter boat rentals, waterfront dining and luxury corporate apartments. The hotel offers complimentary Wi-Fi, 3,400 sq. ft. of event space and shuttle service to the airport & cruise port. Fairfield Inn & Suites by Marriott opened its doors in downtown Fort Lauderdale. The 108-room hotel offers an outdoor swimming pool on its fourth floor, a fitness center, valet laundry service, indoor parking garage, Wi-Fi and fax and copy services. It also contains 1,037 square feet of meeting space for events with up to 75 people. Home2Suites by Hilton Miramar / Fort Lauderdale recently opened offering studio suites and one-bedroom suites featuring kitchens, onsite laundry facilities, fitness center, outdoor pool and lounge area with fire pit, patio with grills and business center. Costa Hollywood Beach Resort, a chic oceanfront hotel featuring 307 suites from studios to three-bedroom suites, opened in October 2018. The resort features a 25,000 sq. ft. rooftop pool deck offering sweeping Atlantic Ocean and Intracoastal Waterway views, a poolside bar & bites and a preferred location just steps from Hollywood Beach Broadwalk. The Dalmar, part of the Tribute Portfolio, Marriott International’s newest collection brand, will feature 209 rooms including 44 suites. The 25-story hotel will offer an elevated arrival experience on the sixth floor along with a lobby bar, pool deck, fitness room and modern American cuisine at The Terrace Grill. It will also include 9,000 sq. ft. of meeting and ballroom space, a ground-floor coffee shop and a high-rise rooftop bar Sparrow, offering stunning 360-degree views of downtown. Accompanying The Dalmar, floors seven through 12, will be Element by Westin, an extended stay offering of 114 rooms including 28 suites and a third floor check-in experience. The new luxury lifestyle hotel is set to open December 2018 with the full launch taking place in 2019. In addition to 136 loft-like rooms at Aloft Weston, the new property will offer 600 sq ft of meeting space and all the brand essentials such as WXYZ® bar, and a Splash pool. Scheduled to open in 2018. Aloft Fort Lauderdale will also provide loft-like rooms and all the brand’s signature amenities, along with 1,500 sq ft of meeting facilities. Opening Jan 2019. A new 23-story Four Seasons broke ground, opening late 2019 with 150 hotel rooms and 95 residences, two restaurants, a spa, fitness center, children’s recreation room, “Beach Butlers” and ballroom and meeting facilities. AC Sawgrass Mills/Sunrise, a new 170-room hotel in Sunrise on property adjacent to Sawgrass Mills, is expected to begin construction in spring 2018 for opening in early 2020. The new hotel will be part of the AC Hotels by Marriott brand. The eight-story hotel will include 5,000 square feet of meeting and event space, an arts-focused library, lounge with tapas-style menu and craft beers and cocktails, health and fitness center and a rooftop water feature and full-service bar. 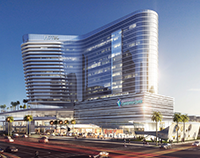 Dual-Branded Tru by Hilton and Home2 Suites by Hilton is expected to open early 2020 in the Flagler Village in downtown Fort Lauderdale. Upon completion, the property will have 112 Tru guestrooms and 106 Home2 Suites guestrooms. The hotel will be 19 stories and feature two distinctive lobbies – each of which will have its own breakfast bar, lounge, and other brand-specific amenities. The hotel will also include an outdoor pool deck complemented by an outdoor bar, a fitness center, and 4,843 square feet of private event and conference space. Pelican Grand Beach Resort, part of Noble House Hotels & Resorts collection, announced the start of its $7 million dollar guestroom renovation, scheduled for completion in December 2018. The transformation includes the complete redesign of 145 guestrooms and 16 suites, as well as the creation of eight new luxury suites, honoring the existing property’s old Floridian charm while blending sleek, fresh concepts and boho-inspired elements to provide a quaint and tranquil vacation experience. The Atlantic Hotel & Spa, Fort Lauderdale’s iconic all-suite beachfront boutique hotel, recently went through a full renovation of its 104 suites. The reimagined and nautically designed Bahia Mar Fort Lauderdale Beach Resort – A DoubleTree by Hilton is an iconic centerpiece of Fort Lauderdale beach. Situated on 40 acres and nestled between the Intracoastal Waterway and the Atlantic Ocean, the property consists of 296 guest rooms, 25,000 sq. ft. of flexible meeting space and a 250-slip marina. In 2017, the hotel underwent a $7 million renovation, which reimagined all 181 guest rooms, hallways, meeting rooms and ballroom in the Tower. In 2018, Bahia Mar renovated it’s 115 guestrooms and common areas in the Marina Building as well as freshening up Breezes, the hotel’s full service restaurant located on the lobby level, replacing the lobby flooring with European white porcelain tile and opening a brand new fitness center overlooking the ocean located on the third floor in the Tower. Seminole Hard Rock Hotel & Casino - Hollywood is currently undergoing a $1.5 billion property-wide expansion. 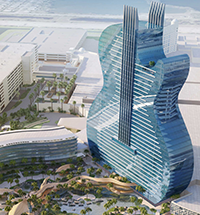 Upon completion in 2019, the property will be home to an iconic guitar-shaped hotel tower, increasing the total number of rooms to more than 1,200. The casino will nearly double in size to include more than 3,000 slot machines and nearly 200 table games, plus a new poker room. Additional amenities include a newly rebuilt Hard Rock Live entertainment venue, exciting new restaurants, bars and lounges, 120,000 square feet of meeting and convention space, as well as a 41,000-square-foot spa. The Le Méridien Dania Beach at Fort Lauderdale Airport (formerly Sheraton Fort Lauderdale Airport & Cruise Port Hotel) is undergoing a $30 million renovation and conversion and will feature 245 contemporary guest rooms, 20,000 sq ft of state-of-the-art flexible meeting space and two redesigned restaurants. Anticipated to open April 2019. The historic Escape Hotel is being transformed into the Gale Boutique Hotel & Residences Fort Lauderdale, with 96 rooms and 129 condo residences, and will feature luxury amenities, sleek furnishings, rooftop sky deck, fitness center, spa and pool. Opening early 2019. The highly anticipated $750 million Broward County Convention Center expansion project is continuing to move forward, with the architects beginning work on drawings necessary for the site plan application. The project will add more than 500,000 sq. ft. of meeting, ballroom and exhibition space, and a plaza along the water with space for three restaurants, an amphitheater and generous outdoor programming space. The project also includes an upscale 800-room headquarters hotel operated by Omni Hotels and Resorts, which will be interconnected with the Convention Center. Fort Lauderdale-Hollywood International Airport (FLL) opened Concourse A in Terminal 1 in July 2017 and added 5 new international gates. Terminal 4 East opened in December 2017 with 6 new international gates, which will replace the international gates in Concourse H. Both projects are part of a $3.2 billion airport expansion and modernization program. New service includes: Allegiant: Flint; Azul: Recife, Brazil; JetBlue: Santiago DR, Atlanta and Grand Cayman; Norwegian Air Shuttle: Madrid and Rome; Spirit: Columbus, Richmond, Guayaquil, Seattle, Cap-Haïtien, Asheville and Greensboro; Southwest: Aruba, San Antonio. The 2,918-guest Celebrity Edge, the newest ship to join Celebrity Cruises’ fleet, arrived to her new home in Port Everglades at Celebrity&apos;s new terminal, T25, in December 2018. Celebrity Edge is an architectural feat on the high seas with the cruise world’s first-ever Magic Carpet, an eye-catching tangerine platform cantilevered on the side of the ship, that will serve as a restaurant, bar and live music venue atop the ship. Celebrity Edge will sail on seven-night itineraries to the Eastern and Western Caribbean. The new “expedited arrival” technology at T25 makes the check-in process seamless. The terminal was designed to be adaptive, featuring modern pod-style mobile check-in desks and also able to accommodate legacy technology. The Visual Voyage interactive artwork is a unique feature, and the light on this artwork travels along each of the 24 time zones of the global map. T25 will also offer Suite Class guests a singular experience along the path to The Retreat, with an exclusive lounge, elevator lobbies, screening areas and even a private rooftop terrace. Holland America Line’s newest Pinnacle-class ship, the 2,650-passenger ms Nieuw Statendam, made her debut at Port Everglades in mid-December 2018. A sister ship to ms Koningsdam, this spectacular new vessel combines classic style with contemporary appointments. Bar Rita, a casual restaurant serving creative Mexican pub fare, offers guests several unique in-house innovations. Bar Rita is spread over a spacious 5,500 sq. ft. space with the dining room and bar on the first floor and the handcrafted margarita bar on the roof. The ultimate casual hangout for anyone who wants to have great drinks and innovative food. A new Fort Lauderdale speakeasy-themed cocktail bar, Unit B, recently opened in Flagler Village, where you need your own personal door code. Unit B is open Thursday-Saturday, 6pm to 2am and features eight Prohibition-inspired cocktails with a twist. Served with whimsical detail, they&apos;re meant to spirit you to a different time and place with all the sights, sounds, and aromas evocative of the 1920s. Del Frisco’s Grille will open their first Broward County restaurant in October serving hand-crafted cocktails and a refreshing, modern menu that draws inspiration from bold flavors and fresh ingredients. The 8,083 sq. ft. new American bar and grill seats more than 274 guests and will be located at the new Las Olas Square building. The new waterfront restaurant, Mastro&apos;s Ocean Club, opened in Fort Lauderdale. Mastro&apos;s features seafood and steaks and is located on the Intracoastal Waterway with yacht docking for those arriving by boat. Stephen Starr, the James Beard Award-winning restaurateur, opened El Vez Mexican restaurant at the W Fort Lauderdale, featuring regional Mexican fare and offering a vast tequila selection and outstanding signature cocktails. Township, in downtown Fort Lauderdale, features innovative urban street-fare including a beer garden with more than 55 beers on 72 taps. Tarpon River Brewing, a joint venture between Riverside Market, The Native Brewing Company and The Restaurant People, opened their doors early 2018. The 11,000-sq ft tap room and restaurant is held in a warehouse space originally constructed as the Snyder Stables in the 1920s. The historical space creates an old-Florida cracker style tap room that includes a 1,000-square-foot house built within the infrastructure and includes a patio for patrons to play yard games. There are 16 rotating taps and a barrel-lined tasting room serving as a space for private events, team brewing classes, a gift shop with brewery merchandise and a crowler filling station. NYSW Jazz Lounge, an upscale outdoor and indoor jazz lounge located in downtown Fort Lauderdale, recently opened featuring contemporary jazz, spoken word, Cuban jazz and Latin jazz. Billy Jack’s Shack opened in Lauderdale-By-The-Sea serving creative comfort food, with a wide variety of drafts and crafts, a raw bar and funky desserts in an eclectic, fun and friendly atmosphere. The Restaurant People recently opened Rooftop @1WLOS in downtown Fort Lauderdale featuring dramatic views, crafted cocktails, extensive wine list and seasonally-inspired small plates. The Restaurant People also opened TRP Taste on the 1st floor of the same building with the first of its kind culinary-focused 24-seat venue built around a rotating, ever-evolving schedule of unique culinary-driven experiences. Celebrated Mexican chef Pablo Salas is behind Lona Cocina and Tequileria, The Westin Fort Lauderdale Beach Resort&apos;s chic new Mexican eatery. Lona will offer Salas’ eclectic, soulful Mexican cooking in a chic, yet funky environment, complete with a breathtaking outdoor bar, casually elegant interior dining room, a special tequila tasting room and multiple private dining spaces. Terra Mare in the newly opened Conrad Fort Lauderdale Beach, offers sophisticated shared-plate dining with a focus on fresh, locally sourced cuisine, going beyond tapas and encouraging an immersive experience. The newly built restaurant and country-music venue, #00 Saloon, opened in June 2018 in Himmarshee Village featuring six bars, and indoor and outdoor performance areas. The restaurant has 216 seats and will offer brunch, lunch, dinner and late-night menus, along with live music and line dancing launching soon. Press and Grind Café, a new spot for coffee, tea, juice, smoothies and sandwiches opened in Victoria Park in June 2018. A second shop on 17th Street is coming soon. Sushi Shack, a contemporary American bar and grill, serving steaks, seafood, sandwiches, salads, and of course sushi. The Boathouse at the Riverside Hotel, a dock and dine, riverfront restaurant featuring Mediterranean-style tapas, hearty main course options and an impressive selection of refreshing libations. El Camino, a Mexican soul-food restaurant and tequila bar, serving tacos, margaritas and tequila offerings with more than 300 selections, and 100 different types of mezcal. The Balcony, an upscale two-story restaurant featuring an open-air rooftop and balcony, serving New Orleans-style cuisine with live jazz. Red Door Asian Bistro, specializing in Thai, Chinese and Japanese favorites, as well as hibachi-grill dining. ETARU, in the Icon Las Olas, features contemporary Japanese Robatayaki cuisine. Sistrunk Market and Brewery, a 40,000-square-foot development with a food hall near downtown Fort Lauderdale, is scheduled to open in November 2018. Chops and Hops, Fort Lauderdale’s first ax-throwing bar, will be a 2,000 sq. ft. venue housing six enclosed ax-throwing lanes with wooden targets in a cozy, lodge-inspired setting. Cooper’s Hawk Winery & Restaurant, a Napa-inspired eatery with a full bar, a winery-inspired private party space and an artisan retail market, will open at The Galleria Fort Lauderdale early 2019. Young At Art Museum presents LightScapes, a solo exhibition of new large-scale light sculptures and an interactive fabrication lab by artist Haiiileen. This immersive and interactive exhibition, runs November 3 through April 28, 2019, featuring a selection of three large-scale sculptures created to give viewers a multi-sensory, educational experience about the wonder of light and a dazzling, translucent maze of marbleized acrylic walls. SeaQuest Fort Lauderdale, a hands-on global sea life education and entertainment experience for all ages, will open during late 2019 at The Galleria at Fort Lauderdale. The 23,000 sq. ft. venue will be home to a variety of animal species from across the globe and designed as a “Quest of Edutainment,” a journey through realistically-themed environments where visitors connect with select animals through various encounters. Gecko ParX, a 40,000-sq-ft family entertainment center, recently opened its doors in Weston. The center includes a main trampoline court with interlocking trampolines, arcade games, two basketball slam dunk courts, a Soft Play playground, two trampoline dodgeball courts and a pit that features jousting and a slackline. Other attractions include a rock climbing wall, a rope course, a modular two-lane ninja warrior attraction with a connected parkour course and more. The Broward College Tigertail Lake Recreational Center, located in Dania Beach, opened the first Aqua Challenge in South Florida. The Tigertail Aqua Challenge is a 8,000 sq. ft. inflatable water obstacle course and playground that includes a climbing wall, trampoline, jungle gym, gigantic bouncing dome and a freefall climbing wall with slide. The all-new Aqua Challenge will tests participants balance, strength, and concentration as it features a 12-foot tall Freefall climbing wall with a breathtaking zero-entry slide and a multi-level enclosed splash zone for playing or relaxing. The Museum of Discovery and Science is opening a new outdoor Science Park in late March. Giant full-body exhibits will demonstrate key principles of physics and engineering while also providing entertainment and group interaction. The outdoor expansion of the Museum’s hands-on learning experiences is a family based zone of discovery welcoming visitors of all ages. Here, visitors explore together to strengthen science understanding and science thinking skills through hands-on exploration in a beautiful outdoor setting. The exhibits provide multiple, content-rich opportunities in which visitors can experiment with basic principles of the physical world and come to intuitive understandings about how they work. Madisons New York Grill & Bar is joining the Riverside Promenade, an all-new 2.2-acre dining, entertainment and retail complex set to open in late 2018 directly on Atlantic Boulevard and the Intracoastal waterway in Pompano Beach. The waterfront restaurant will be an upscale 10,000 sq. ft. concept with 500-seats indoor and outdoor and waterfront docking available, set to open in the late fall of 2018. 100 Las Olas, a new 121 residence project, will include a Hyatt Centric Hotel featuring 238 guest rooms and a ground level restaurant/bar with indoor and outdoor seating, along with 8,500 sq. ft. of retail and fine dining. The project is slated to be the tallest building in downtown Fort Lauderdale with completion in 2020. X Las Olas breaks ground to redevelop the Riverfront in downtown Fort Lauderdale. Part of the new PMGx multi-family housing division, comprised of “social living” rental communities that cater to modern professionals who seek a connected, fun and convenient lifestyle, X Las Olas will also include 30,000 sq. ft. of ground floor retail space, featuring restaurants, markets, services, and entertainment along the waterfront on Fort Lauderdale’s New River. Slated for completion in 2020.